On the eve of a Senate vote likely to result in the confirmation of Judge Brett Kavanaugh to the U.S. Supreme Court, two of the three sitting female justices said the court must guard its own reputation for being impartial, neutral and fair. Justices Elena Kagan and Sonia Sotomayor shared concerns that widespread polarization in the country's political environment could affect public perceptions of the court's legitimacy. Speaking at a question-and-answer session during a conference at Princeton University dedicated to celebrating women, Kagan and Sotomayor did not directly address the prospect of Kavanaugh's confirmation but said there was value to maintaining a "middle position" on the court's bench. "This is a really divided time," Kagan said. "Part of the court's strength and part of the court's legitimacy depends on people not seeing the court the way they see the rest of the governing structures of the country now." Their pre-scheduled appearance at the "She Roars" conference came just hours after Sen. Susan Collins, R-Maine, and Sen. Joe Manchin, D-Virginia, announced they would support Kavanaugh's nomination. The full Senate is expected to hold the final vote on Saturday. "We have to rise above partisanship in our personal relationships," Justice Sotomayor said. "We have to treat each other with respect and dignity and with a sense of amicability that the rest of the world doesn't often share." Sotomayor said she sought out "the good" in her colleagues and that the court's members had a practice of maintaining collegial relationships even in times of disagreement. "If you start from the proposition that there's something good in everyone it's a lot easier to get along with them," she said. "It's just the nine of us," Kagan added. "We all have a vested interest in having good relations with one another." The two justices, both Princeton graduates, were interviewed before an audience of more than 3,000 by another alumna, Heather Gerken, who currently serves as the Dean of Kavanaugh's alma mater, Yale Law School. Though she did not raise the allegations of sexual misconduct against Kavanaugh on Friday, Gerken had previously said in a statement she shared the "deep concern" of other Yale faculty members about his nomination. 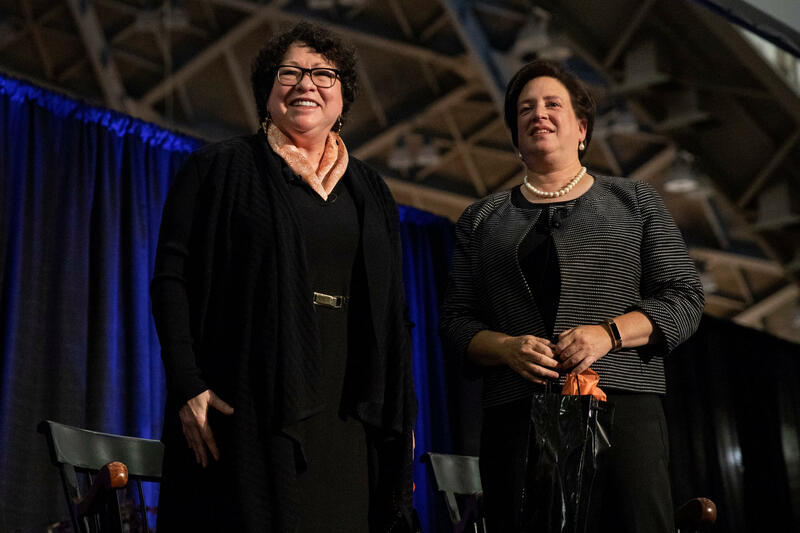 The justices, both of whom were appointed to the court by former President Obama, also discussed their experiences as female trailblazers in their own fields and at Princeton, which first began accepting women undergraduates in 1969. "You can't be a professional woman, even today, whether it's in law, in medicine, in any field, without having a moment where someone is going to treat you differently because you're a woman," Sotomayor, who graduated from Princeton in 1976, said. Both justices dismissed the notion that they were interrupted more frequently than their male colleagues on the basis of their gender, as a recent study suggested. "I don't feel that on the bench," Kagan said, adding that the statistics informing the study are more likely due to the fact that she and Sotomayor are relatively junior justices. Kagan insisted that she, Sotomayor and Justice Ruth Bader Ginsburg "ask a lot of questions" and give lawyers "a good run for their money." "None of us are shrinking violets," she said.